Thank you for all the well wishes regarding our move! Unfortunately, our house still isn't ready. I would complain about the builder, but he's my husband and I love him madly regardless of how long it's taking. Doing so much of the work ourselves takes longer, but stretches our dollars much further and in the end, that's a very good thing. I won't bore you with details of our delays, such as of deluges of rain dumped on north Texas by a tropical storm (thanks, Hermine), broken sewer taps and dealing with the water department, or our current foe, the electric company. I won't bore you with the story of my 20 plus consecutive days with a headache, which is now gone thanks to some strong antibiotics for a sinus/ear infection and a round of steroids. (I hope I never have to take steroids again! They made my feel terrible.) Sorry, I guess I just bored you anyway. We've probably got another week until we can move and I'm anxiously tapping my foot. Living with my mom has really been fun, but I want my stuff out of storage! I packed for about three weeks and we've been here almost six. 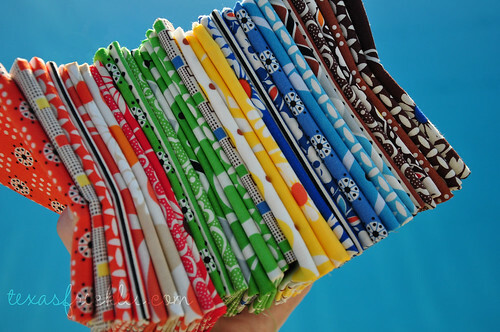 I can hear my fabric crying out to me from the bottom of a massive stack of boxes. I'll share a couple of construction shots of my favorite room in the new house, the kitchen! My kitchen island without it's butcher block top and the floors pre-scraping and staining. A corner of the kitchen with counters (absolute black granite) and backsplash (Cararra white marble). That hood is over the cooktop that still hasn't arrived. I'm so excited about cooking in that kitchen! I officially pledge to eat out less often after the move. 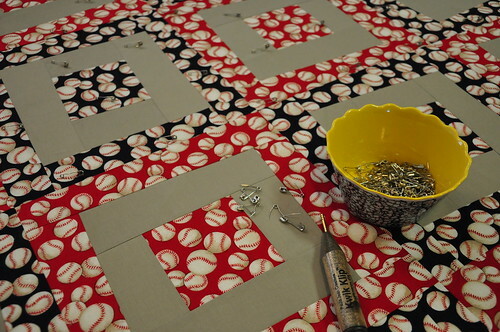 In crafty news, I've almost finished this quick baseball baby quilt for a shower on Sunday. It's not my really my style (sports), but I think it will be a home run with it's recipient. wha wha. Alright, I know what you are thinking... get to the big news, Mel! Oh, you mean who I'll be sending this bundle of happiness to? Ashley who blogs at Our so called life! And, wow, does she have some adorable kiddos! I'll send you an email shortly, Ashley. 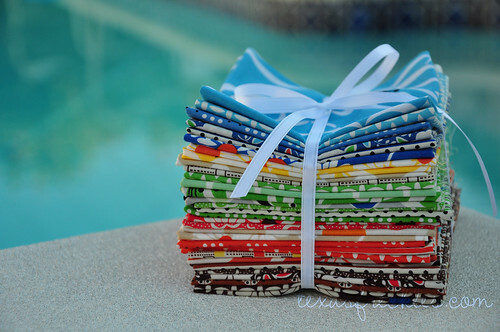 I hope you enjoy the fabric! Well I'm off to run some errands and seal the backsplash tile in the kitchen to prepare it for grouting. If anyone wants to help, come on over! Your kitchen is gorgeous! Bet you can't wait to move in! Wow,that kitchen is gorgeous. I am super jealous! It would be my favorite too. Glad you are feeling better. Congrats to Ashley! Aaaa! I LOVE the island... I LOVE the kitchen!!! I'm happy you're feeling better and it's good to see you blogging again! So glad that your headache is gone, I am sure that was tough to have while you are in the middle of building your home. - and don't worry, soon you'll be able to release the fabric from its cardboard boarding kennels! congrats ashley!! you lucky girl....all I can say is WELCOME BACK!!! I've been checking your blog at least twice a day to see if you've come back and you've totally made my friday!!! Welcome back to blogland! We missed you! Congrats to Ashley. That kitchen almost perfectly matches my dream kitchen, you lucky girl! First of all, I LOVE your kitchen! Understandably, you're anxious to move in, for many obvious reasons! When you get moved in, I hope you will take us on a cyber-tour! Sorry you had such a headache and had to go on steroids (no fun!). Glad you're feeling better. Great kitchen! Glad you are back! Congratulatons to Ashley! Beautiful kitchen! YAY! Thank you so much! I just sent you an email. Glad you are back to the blog. LOVE LOVE LOVE the kitchen (that island is my favorite color!!!). Welcome Back! Hang in there, hang in there, hang in there...Glad you're feeling better and just keep thinking how great your house is going to be and how much you've stretched your funds!! While I'm sad I didn't win the fabric, I'm glad you're back! Also I LOVE the color of your island. So great! Your kitchen looks wonderful. Construction delays are never fun but it will all be worth it in the end. Sweat Equity is a wonderful thing! I pledge to cook for you in that kitchen if you let me move in! I can't wait for you! Welcome back! I totally understand how things run behind, whether you're doing them yourselves or not. I was supposed to be without a kitchen for 2 months--it was 6 before the counter and sink were finally installed! 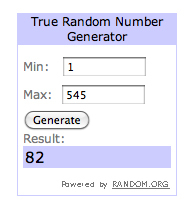 Best of luck to you, and congrats to the giveaway winner! Wow, your kitchen is fabulous! Enjoy your new house...and we're glad your back! It's nice to have you back. I just love that kitchen especially the marble tiles on the splashback. Here in Australia you don't seem to be able to get any sort of marble tile that isn't a foot square floor tile. So I am particularly jealous. 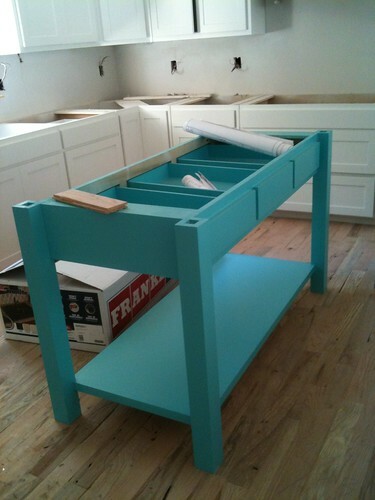 And the island unit is just gorgeous! Hey Melanie, Welcome back (to blogland, I mean)! Your kitchen looks awesome... I love the sound of a butcher's bench. OMG!!!! Awesome kitchen! I love the island color,pretty. That marble must be popular now my husband (builder too) just installed some it just like yours. I feel the pain of wanting to get moved in and back to normal, just got back in our space too. Hope you are able to move in soon. Your kitchen is looking great! Your island is going to be fabulous! I can't wait to see more pictures of your house. Congrats to winner. Whatta great prize! love the kitchen! 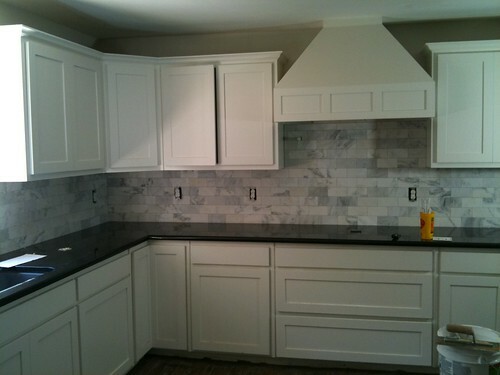 just wondering if you are going to put up more photos of your completed kitchen and what color fixtures you went with. tell all! I absolutely love your island. I'm also in the process of getting ready for a major renovation including the kitchen. Did your husband build the island or did it come from a cabinet mfg or something. I would love something like it. Could you share where you got it?